The health insurance Open Enrollment Period for 2018 lasts only 45 days. HealthCare.com provides insight on the abbreviated timeline and other notable changes to watch out for. Miami, FL and New York, NY (October 27, 2017) – Despite efforts from the federal government to reform the Affordable Care Act, the 2018 health insurance Open Enrollment Period – the time when Americans can change Obamacare health insurance plans or a join a new plan for the upcoming year – will still begin on November 1, 2017. But this has left most Americans confused about how this year’s open enrollment differs from the previous three. Unlike previous Open Enrollment Periods, which each occurred over a 90-day window, this year’s open enrollment will last just 45 days – starting on November 1 and lasting until December 15. The shortened timeframe means Americans will have less time to make decisions about their healthcare. 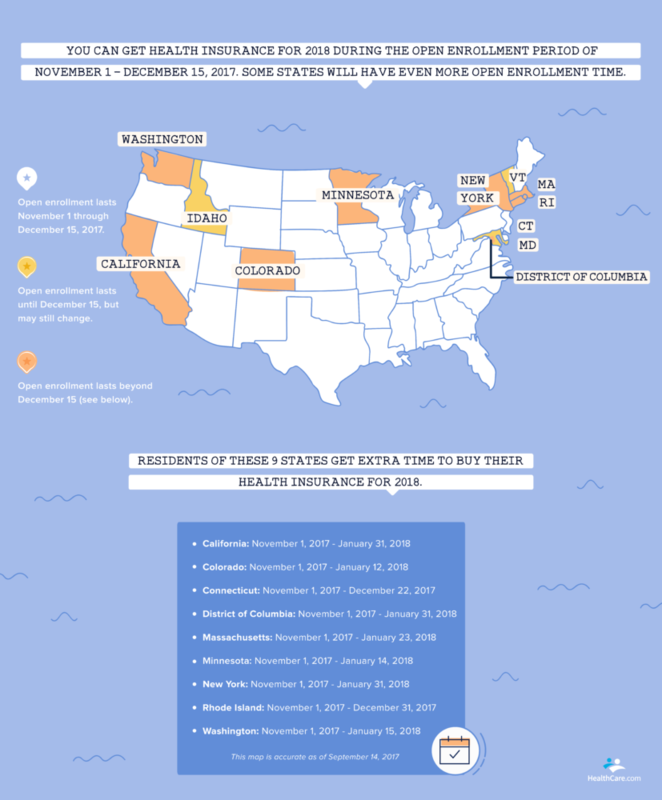 While some U.S. states have extended the enrollment period for their individual state exchanges (notably, California and New York), most states will follow the condensed 45-day enrollment window. “Costs for ACA plans overall will be higher compared to previous years – with insurers charging, on average, 20% more on premiums. These costs have outpaced income growth, leading to a unique affordability gap – where people make too much to qualify for Obamacare tax credits, but make too little to actually afford a Bronze plan. Under the law, those unable to afford a Bronze plan are exempt from paying the penalty for not having health insurance (referred to as the “Marketplace affordability exemption”). This year, we expect more than 1.5 million people to qualify for that exemption – a significant increase from the 600,000 two years ago. Approximately 20 million people will shop for health insurance during this Open Enrollment Period. HealthCare.com, a top destination for consumers looking to shop around for the best-priced plan, offers both non-Marketplace and Marketplace health insurance, as well as alternatives to ACA coverage (like short-term health insurance plans). Just in time for this open enrollment, the company’s website features a revamped consumer experience – with an enhanced search-and-compare platform that better informs and suggests plan options based on consumers’ needs, as well as a new, comprehensive information hub – ensuring healthcare shoppers can make better-informed decisions about their coverage. For important updates throughout open enrollment, follow HealthCare.com on Facebook, Twitter, or visit HealthCare.com/info for more information.